Daemon Parallel only 99p or E0,99 or $1.56 on Kindle! A very quick update to let you know The Daemon Parallel is currently on promotion on kindle! Here it is for 99p at Amazon UK, E0,99 at Amazon France, Italy, Spain and Germany (where it seems to be racing up the Foreign Language charts – thanks Germany! ), and $1.56 at Amazon US (where it’s just gained its first US review). At 99p or its equivalent, that’s about 0.00132p per word. Or about half the price of a cup of coffee. Staggeringly good value, if I do say so myself – and if you combine it with some other purchases, you can even earn an amazon voucher as part of their Kindle Summer Marathon. 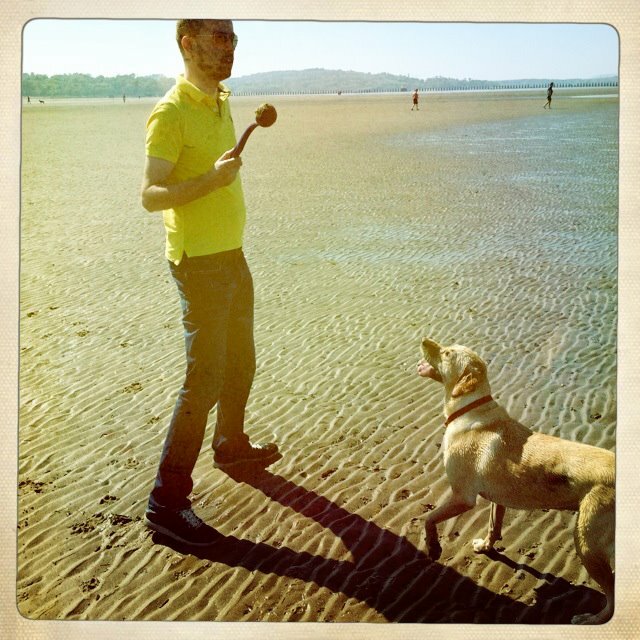 Sunny weather has finally reached us here in Edinburgh – ideal dog-walking weather on the beach! If you’re up/over/down visiting for the festival or fringe, I hope you have a great time exploring the city (and maybe spotting some of the locations featured in the book). And if you’re having a look around the city’s book stores, you may find signed copies lurking among the shelves of The Edinburgh Bookshop, Blackwell’s or Looking Glass Books – delightful stores all, and well worth a browse.